As demand for better image quality from smaller cameras continues, more options flood the market with varying sensor and lens specifications. These range, from mirrorless interchangeable lens Hybrids featuring either an APS-C, Micro Four Thirds or 1-inch sensor depending on the manufacturer, and more recently we’ve seen a trend toward fixed lens cameras with large sensors such as the full frame Sony RX-1, the Canon G1 X with its 14 x 18.7mm sensor, or the recently announced APS-C Nikon Coolpix A.
Hybrids and larger compacts like the RX1 or G1 X are not really pocket size in the same way as traditional compacts with retractable lenses however. 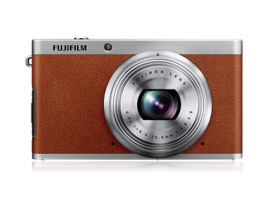 The Fujifilm XF1 on the other hand is a compact in the true sense with a slim line body that, with the lens retracted, will slip into a shirt pocket. XF is a new product line for Fujifilm and sits within their Pro/Enthusiast X range, which now offers three types of camera; Interchangeable lens Hybrids with an APS-C sensor like the X-Pro1, fixed lens cameras with an APS-C sensor like the X100 and Bridge or Compacts like the XF1 with a smaller 2/3-inch sensor. With an ISO 100-3200 (expandable to 12800 at lower resolution) sensitivity range, 4-Stop image stabilization, a manual zoom ring, 3.0-inch 460k dot LCD, HD video, RAW image capture with in-camera processing and “Advanced Filters” for previewing processing effects on screen, the XF1 has lots on offer. Let’s see how that 2/3-inch EXR-CMOS sensor holds up in the DxOMark Scores. Introducing a new XF product line, Fujifilm looks set to launch more options in to the ever-popular small camera with high image quality category. The first camera in the new range, the XF1 uses the 2/3-inch type sensor that’s smaller than the APS-C, Micro Four Thirds or 1-inch type sensors used in interchangeable lens Hybrids, but it’s a little bigger than the 1/1.7-inch type predominantly used in more expensive compacts. The 12-megapixel 2/3-inch EXR-CMOS sensor at the heart of the XF1 puts in a solid performance in the DxOMark Scores, ranking 12th overall for compact and high-end compact cameras. That said, despite the slightly larger sensor, it only boasts roughly the same image quality as competitors, such as the Nikon P7700, Olympus XZ-2 iHS, Canon PowerShot S110, and Panasonic LX7. While these competitors achieve their best scores at the lowest ISO, the XF1 is a little stronger through the sensitivity range. The relatively small sensor compared to APS-C or Micro Four Thirds sensors however mean compact like this are always going to struggle with noise, and with a Low-light ISO score 199 ISO the XF1 struggles to achieve good image quality at higher sensitivities. Dynamic Range, or DR Mode, where half the pixels are underexposed. True resolution is divided in two, but a specific demosaicing process renders a full resolution image with wider Dynamic Range. High Sensitivity, or SN Mode, where pixel fusion technology “mixes” pixels of the same color maintaining the full resolution, but with greater sensitivity. High Resolution, or HR Mode, where all the pixels are exposed at the same level, rendering a “true” full resolution image. 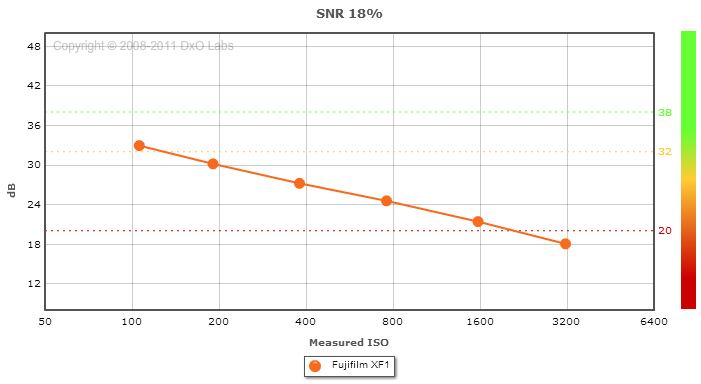 To ensure a fair comparison with sensors from other manufacturers however, DxOMark presents Sensor Scores for the Fujifilm XF1 using a normal exposure mode and not EXR Mode. Fujifilm’s XF1 utilizes a 12-megapixel EXR CMOS sensor that can intelligently switch between three different EXR modes based on the scene and lighting to improve either Dynamic Range, Sensitivity or Resolution. With a DxOMark Overall Score of 49, the 12-megapixel 2/3rd-inch EXR sensor ranks in 177th place for all sensor on the database, and 12th for compacts and high-end compacts, showing us the Fujifilm XF1 has a great place amongst the pocket sized competition. A Portrait (Color Depth) Score of 20.5 bits ranks 171th overall, 10th for compacts and demonstrates the XF1’s ability to capture great color at base ISO. 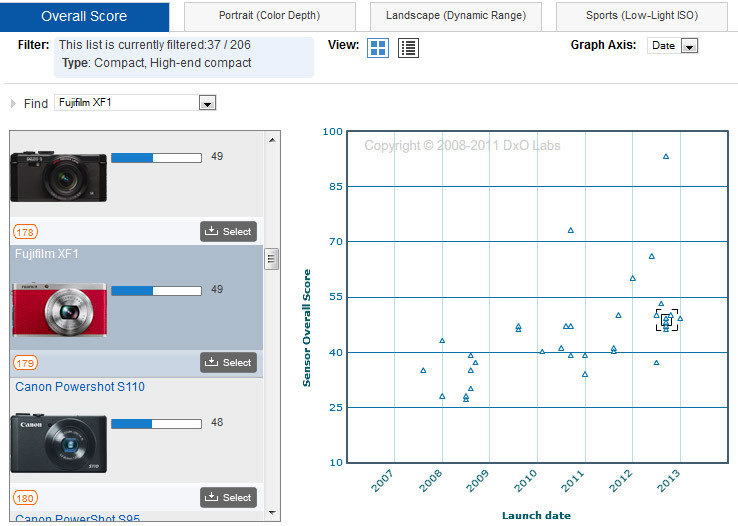 For Landscape (Dynamic Range), a score of 11.2Evs places the XF1 ranks 115th overall, and 13th for compacts. Its Sports (Low-light ISO) Score of 199 ISO is 174th overall, but the best ranking for the XF1 in the compact category where it finishes in 9th. Whilst its ISO performance is strong amongst its peers, its score is too low to achieve good image quality under low-light conditions, and at high ISOs like ISO 3200 the XF1 drops below 18dB for SNR 18%. Ranking in 12th place overall for all compact and high-end compacts on the DxOMark database the Fujifilm XF1 puts in a strong performance against its direct competitors. Despite ranking 9th for Sports (Low-light ISO) amongst compact cameras the 2/3-inch sensor has a poor Signal to Noise Ratio of less than 20 dB at the maximum ISO3200 sensitivity.